Click on the image to download a printable .pdf version of the article. 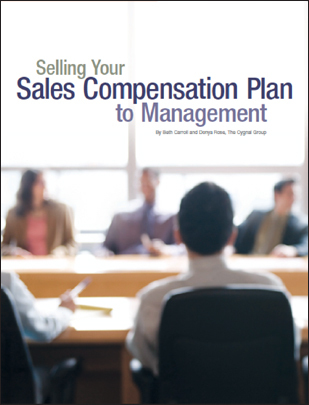 WorkSpan Magazine, February, 2011 – Learn how to prevent last-minute derailment of your sales compensation design effort, and make sure your plan designs reflect the top priorities of your most influential stakeholders. An important step in many sales compensation design projects is the executive review. At this meeting the plan designs that you and your design team have worked so hard to develop during the past several months will finally be presented to the senior leadership team (sometimes called the steering committee or the executive committee). Ideally, the executives will ask a few pointed questions, conclude that you and your team have done a great job, and approve the plans as recommended. But sometimes an influential executive will challenge the fundamentals of the design or, even worse, the need to change the compensation plans at all, and the work of the design team seems to vaporize right there in the room. fluential stakeholders. Part of the solution lies in having the design team understand the top business priorities and ensuring that the plans support them, and part of the solution lies in helping executives understand the principles and practicalities of what the organization can and should measure. The first strategy is to build consensus around the need for change among the leadership group at the outset of the project. Gain its insights into the company’s market strategy and the ways in which the salesforce must contribute to its execution. Executives are often not aware of the details of the current sales compensation plan, but they may have opinions about how it’s influencing sales representative behavior. Gather their opinions without trying to correct any misconceptions at the time, focusing on the needed business results and not the plan mechanics. During this process, it may be helpful to present to the executives a scenario as follows: “Imagine that we got this sales compensation plan exactly right for next year, that it was documented clearly and communicated so that everyone involved totally understood it. It was administered so that payments were accurate and on time, and the reporting clearly showed the relationship between sales results and compensation. Then we got to the end of the year and you concluded, ‘That sales compensation plan did exactly what we needed.’” Then ask them, “How do you know?” You need to find out what their definition of “success” is and if it is primarily behavioral, business results-oriented, or a bit of both. Some executives may want to tell you what the commission rate should be, or whether a hurdle is needed, but try to focus them on providing clarity about the needed results at this point. Be aware of the different perspectives that will be held by the various senior leaders, and be ready to ask questions that target their area of concern. The CFO will be focused largely on the overall cost of compensation as it relates to sales, and whether the company is getting the appropriate return for what is likely a very large investment. The head of marketing or product development may believe that the salesforce is not adequately presenting the products in the best light, selling across the product lines in the right proportions, or focusing on the right customer set. The HR leader may be concerned about the culture of the company and its image in the marketplace as an employer of choice for top salespeople. The top sales manager may be concerned about mounting turnover and lack of motivation among the representatives, or challenges with attracting top talent to join the salesforce. Gather all these perspectives and then begin to build your case for change by looking for root causes of the issues they have raised. This will become your “burning platform” that will help convince the organization that it is time to change the compensation plan. is stuck and cannot make a decision, call a meeting of the executives to include them in the process. If you cannot pull together a full meeting, spend a few minutes with each executive, updating the issue and hearing resulting opinions. One of the key roles for the project leader is to be a change agent, and this involves many conversations outside of design team meetings. It’s important to be sure that all perspectives are being represented, especially those of stakeholders who are not in the meetings, or who may be hesitant to speak up during the meetings. The process used to develop the plans. Give credit to those involved, and show the thoroughness of the analysis and how many points of view were included. Present all information on one slide. Business objectives for the effort. List objectives on one slide. Key changes year over year. List changes on one or two slides. The basic structure of the plan. The structure could be illustrated using your most highly populated individual contributor sales role. Present the information on one to three slides. The modeling results in terms of the cost of compensation. List the results on one slide. Scenarios to include in aggregate modeling: 1) all at threshold, target and excellence (this provides your widest boundary set, but is not terribly realistic), 2) a bell curve distribution with the center of the curve over threshold, target and excellence, or points just above and below target. 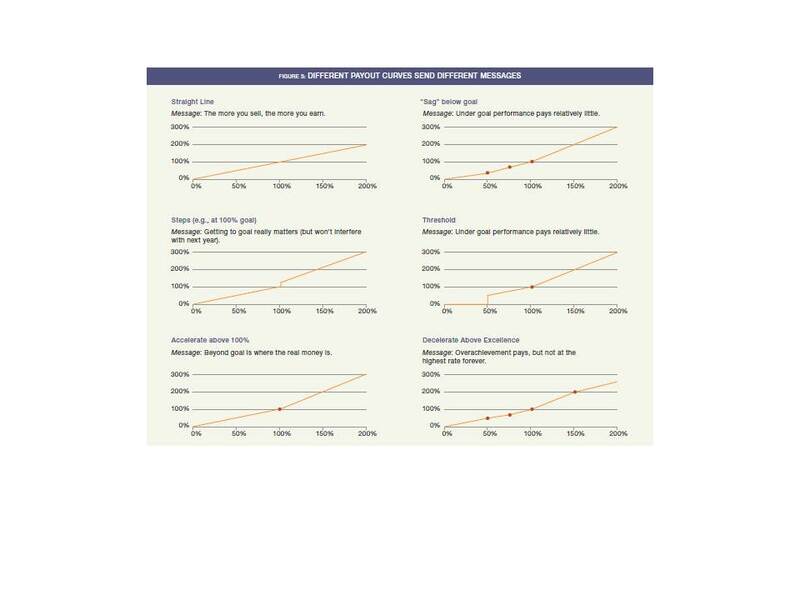 This provides a more realistic view of the actual costs of the new incentive plan. Data to use for incumbent modeling: Historical data is the best if you can get it, provided there wasn’t a serious economic shift (as in 2009) or some significant change in company strategy that renders the data invalid. If you can’t use historical data, then you can use the anticipated goals or targets for the upcoming year. Using goals is reasonable only if the goals are reasonable. Sample communication materials to be used in the rollout of the plans. Attractively group a few key screenshots of presentation pages on one slide and the rollout schedule on another slide. This way leaders will know when they can expect to begin hearing scuttlebutt about the new plans (sales compensation changes are rarely quiet events in an organization). Your leaders need to be prepared with high-level answers to articulate the business case for the change, and the benefits the new plan designs will provide to the company and the salespeople. 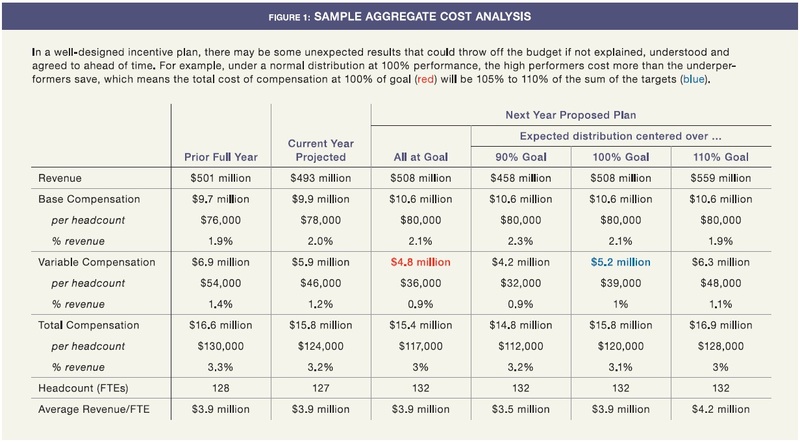 The senior leadership team is unlikely to want to get into detailed examples of exact calculations, but will want to understand the aggregate cost of compensation at different performance levels and how this will support the company’s business objectives (see Figure 1). It is important that senior leaders understand how the cost of compensation should change over time, as a percentage of revenue or profit. While individual compensation levels may be increasing, sales productivity (revenue, units and/or margin) should be increasing at a faster rate, with the result that cost of compensation as a percent of revenue is decreasing over time. This doesn’t necessarily happen every year, as some years are intentional investment years and others are “harvesting” years in which the hard work of several prior years is realized. But during a multiyear period, the cost of compensation should continue to come down in successful businesses (see Figure 2). Often there is confusion about the need to pay sales incentives for less than target performance, or when the overall company is not reaching its goals. Be prepared to talk about the psychology behind incentive compensation and the value driven to the bottom line when, for example, 40 percent of your sales representatives are motivated to move from 80 percent of quota to 90 percent of quota. 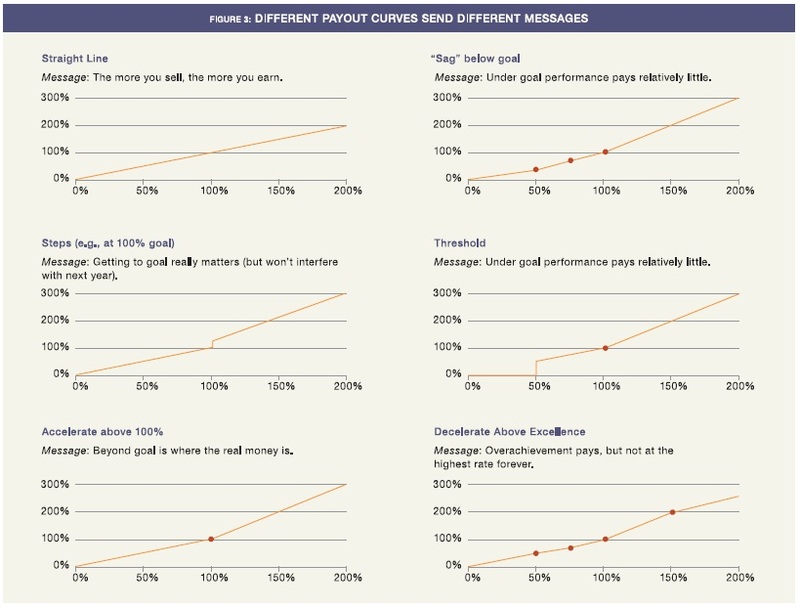 Show examples of a few of the different payout curves in use and how they will drive the desired results (see Figure 3). It is often also useful to draw the distinction between over-and-above bonus compensation (like that often offered in broad-based employee pay incentive plans) and true at-risk pay needed to earn the market value of the job (like that usually offered as part of a sales compensation package). The design team, the executives and other senior leaders will all be influential in selling the plans to the salesforce, who ultimately must be motivated by the plan for it to be successful. Enlisting the support of leadership early and often throughout the process will help ensure a smooth design process and a successful new plan year.